Another financial year has gone by, with strong performance tailwinds helping to create some significant opportunities in markets around the world. As at 30 June 2017, the MSCI world index had risen 15%, with value stocks in a number of sectors benefitting from a market sentiment shift away from deflation to reflation, and a view that the global economy is healthy and growing. In the US, software companies performed well, with Dell and Oracle continuing to deliver strong results. While the market has questioned Oracle’s ability to keep up with emerging software as a service (‘SaaS’) competitors like Salesforce.com and Workday, they have executed their strategy formidably. Larry Ellison set up the company in the 1970s and since then, has done an exceptional job in growing Oracle into the leading database management software company globally. The management team have done a notable job in positioning the company so that it can benefit from the shift of applications and databases to the cloud. The investments that they have made over the past five to ten years are starting to pay off as they win market share in the enterprise relationship planning, human capital management and even in the customer relationship management application software markets. While some of their competitors do have effective SaaS products in some of these verticals, Oracle has a complete product offering across the different types of applications used in different industries. As Oracle’s cloud revenues continue to grow at a much faster pace to the rest of the business, growing at 58% in the past quarter, the value of the group’s earnings stream increases as these revenues are longer-term in duration. It was nice to see the stock market finally start to give the company credit for this growing annuity stream in the last quarter. In China, online advertising expenditure continues to grow, as the market starts to re-rate emerging markets valuations and businesses continue to deliver strong earnings growth. For the first six months of 2017, the MSCI Asia ex Japan index was up 22%, delivering its best first half performance since 2009. This index has underperformed the S&P 500 over the past eight years but is starting to claw back this underperformance. Several stocks have exceeded the average company performance in Asia, with Autohome being a stand out performer, nearly doubling since last year. Autohome delivered revenue growth of 23%, net income growth of 34% and average daily unique visitor growth on their mobile platforms of 23% in the last quarter. The business continues to be the leading portal for automotive dealers to advertise their inventory online. For the past eighteen months, we have been saying that the consumer staples sector looks expensive. Despite this view, we have seen some high quality companies with strong brands at opportunistic prices including Nomad Foods and Britvic, who have performed well in the past year. They are both European companies led by highly experienced and impressive management teams. We have gotten to know Simon Litherland, the CEO of Britvic, over the years and have been impressed by what he has done with the company since taking the CEO role in 2013. Simon joined Britvic from Diageo, having managed a number of their global businesses over a period of twenty years. 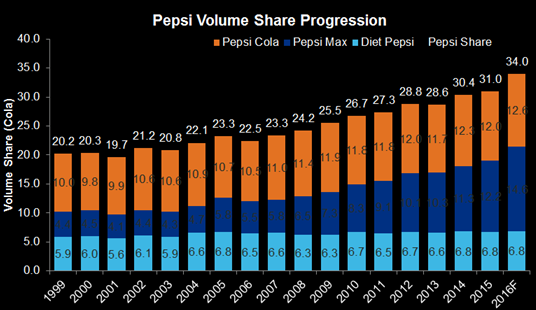 In Simon’s tenure at Britvic, the business has continued to deliver on growing Pepsi’s market share in the UK (being the bottler for Pepsi’s brands in the UK and Ireland), as seen in the chart below. Nomad Foods is also led by an experienced board and management team. Stefan Descheermaeker, the CEO has decades of experience in consumer businesses including Interbrew and Delhaize. Martin Franklin, the co-chairman, was the founder of Jarden and did a tremendous job building out Jarden into a leading consumer products business in the US and we think the board’s guidance is helping the management team to build out Nomad Foods into a leading frozen foods company in Europe. Nomad Foods owns the Birds Eye brand in the UK as well as the Findus and Igloo brands, which are leading frozen food brands in Central Europe and Scandinavia. The management team have done a good job in returning Birds Eye to growth in the UK and are on track to extract significant cost synergies from rationalising their manufacturing plants. 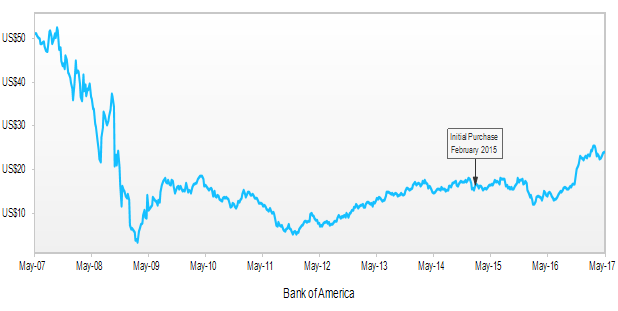 Bank of America was a standout performer over the past year. Brian Moynihan, the current CEO and chairman of Bank of America has done an exceptional job since he was appointed in 2010, navigating the regulatory environment since the global financial crisis and repositioning the bank so that it can maximise its structural advantages. He has been shrinking the bank to greatness, cutting out a significant amount of costs since 2011, while still managing to grow the deposit book. They have significantly improved the quality of their loan book and customer base and are one of the biggest beneficiaries of rising rates in the US. It is nice to see that the stock market has finally started to realise the true value of Bank of America in 2017.